I’ve been blessed to spend this summer in beautiful Asheville, North Carolina. I love the plentiful hiking and incredible downtown, but my favorite part of the summer has probably been cruising down the Blue Ridge Parkway, the county’s greatest auto-oriented national park. The Parkway is dotted with overlooks, places to pull off and take in the views. At first, these vistas brought me a profound sense of peace, knowing intuitively that the forested hills and valleys I saw were mostly unscarred by human interference. But I don’t have that luxury anymore—at least not since my colleague Josh told me about the tragedy of the American Chestnut. The American Chestnut was long a dominant tree in the Appalachian Mountains. Growing up to a hundred feet tall, it covered the landscape from Georgia to Maine and played a critical role in the region’s ecology for thousands of years. In 1904, a fungal pathogen called Cryphonectria parasitica was accidentally imported to the U.S. from Asia. It attacked the American Chestnut, killing three billion trees within fifty years and essentially wiping out the species. Nowadays, we recognize rhododendrons and oaks as the most common vegetation of these mountains, but the state of our biodiversity is not as natural as we believe it is. We think we’ve seen the true forest, but we haven’t. The American Chestnut in its former glory. The same goes for our cities. When we look around our cities, we think we understand them and how they were built, but we really have no idea. Between the empty parking lots and demolished buildings, it’s hard to comprehend what we’ve lost. If a tree falls in a forest and nobody sees it, there’s no way to remember it was ever there. In a similar way, there are few easily visible ruins to remind us that in many towns and cities, a rich architectural and urban heritage once existed where malls, parking lots and highways now stand. 60 Years of Urban Change, created by the University of Oklahoma’s Institute for Quality Communities, is a fascinating interactive resource with which we can begin to understand the staggering effect of urban renewal. If you check it out, you’ll see that although these policies were meant to remove “blight” and, urban renewal itself is often the blight. But exactly how much are our metaphorical chestnuts worth? If you’re interested in the cost of ripping out blocks of high-density development to make room for cars, look no further; Urban3 did the math. The 1954 Interstate Highway and Defense Act gave cities federal funds to build highways through and around their downtowns. Not only did this increase auto-dependency, it decimated many urban neighborhoods, especially in majority-minority communities. Given the tax revenue potency of existing downtown buildings, what would the value of these parcels be had they survived urban renewal? Josh found the answer in Minneapolis. Using a set of historic maps, he discovered the block pattern that once existed where seven square miles of highways now run through downtown. He then mapped the highway onto the streetcar map to determine which blocks were bulldozed to make way for the highway’s construction. The slider map below zooms in on the I-94 and I-35W interchange area, first with the highway, and then replaced by modern value per acre estimates for the blocks that were demolished. 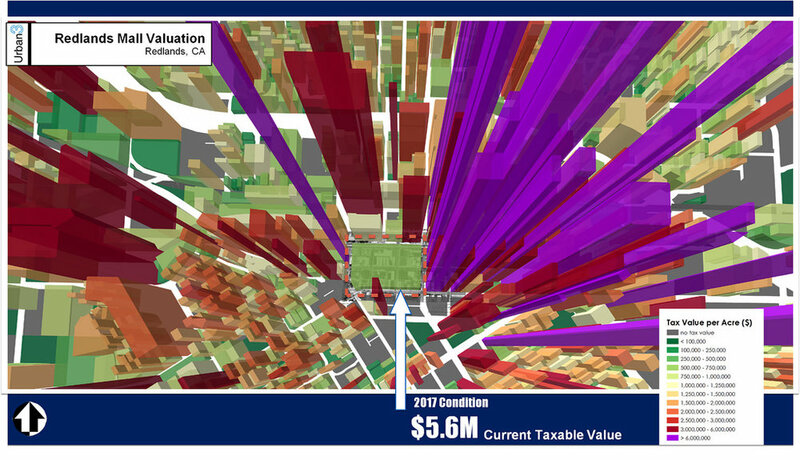 The map above shows tax value per acre for downtown Minneapolis. Taller, red and purple plots are those with high tax value per acre. Lower green plots are those with little tax value per acre. Slide the bar to the left and right to compare the present day city, threaded with highways, with the potential lost value if highways hadn't been built through the city. Projecting present-day values of neighboring parcels onto the missing blocks suggests that the highway eliminated buildings that would be worth at least $655 million today. This estimate is conservative because the neighboring parcels that these estimates are based on would likely be higher themselves if they abutted similar blocks rather than a large highway. Urban3 estimates the loss of billions of dollars in tax producing real estate value over several decades. The map above zooms out to show the full significance of the value lost due to highway construction. The value per acre of existing buildings is grayed out here, so the full extent of the lost potential value due to the highway is clearly visible. A typical Tuesday during rush hour. Was it worth losing $655 million in value for this? This is not to diminish the importance of sound transportation infrastructure. But we must understand the fiscal trade-offs we make when we choose different land uses, especially if we want to help leaders to make transportation and development choices with more knowledge of potential outcomes and consequences. If you’re thinking that the highways provide worthwhile value to the community, here’s a video showing how busy this highway is at 9:00 AM on a normal business day, Tuesday, March 27. Sure, drivers can save a little time by whizzing through downtown in terms of potential taxable real estate, but is that really worth $655 million? 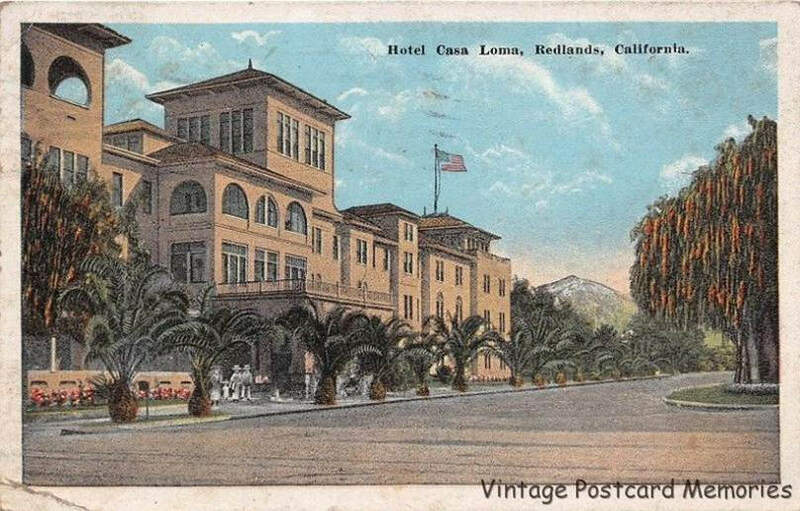 In the early 20th century, Redlands was a sight to behold: Thousands of acres of orange groves surrounded a prosperous little oasis of a town. The citrus industry supported blocks of gorgeous buildings with a distinctive regional architectural flavor. This heritage was largely ignored during the period of urban renewal, and many of these irreplaceable assets were lost. The Hotel Casa Loma was once visited by Theodore Roosevelt. It was demolished in the 1950s to build a modern supermarket. While we cannot reverse these mistakes, we must understand the financial impact of what we lost when considering how to move forward. Using the same technique as in Minneapolis, Urban3 explored the opportunity cost of one of Redlands' most visible modern developments: The Redlands Mall. In 1977, a Spanish revival hotel and several blocks of downtown buildings were razed to build a suburban shopping mall. Eventually it went into decline and has been closed for several years. In its current form, the building is worth $5.6 million. If the mall had never been built, the property is estimated to be worth $21 million. Again, this is a conservative estimate. Placed side by side, the difference in tax potency is clearly visible. These maps include only the current difference in tax production, but the opportunity cost of urban renewal is a loss accumulated over decades. Simply put, the community threw away at least $15M of taxable value. Fortunately, it seems that the city is making encouraging steps in the right direction. In the four years since Urban3’s project, Redlands approved plans to tear down the mall and replace it with mixed use development. But we shouldn't move forward without considering what was lost. Will the new development be built using knowledge gained from past mistakes and improve in terms of design, quality, and durability? Besides the importance of historic preservation, will we choose to design and build for lasting value? In dealing with these questions Redlands must remember something vital: like other American communities, it is catching up with its own past. These are the problems of our age. They are complex, and they demand multidisciplinary, antifragile solutions. We can’t afford to make decisions based on incomplete information. So the next time you walk around your city, don’t assume the forest you see is in its natural state. The baseline may have shifted, but that doesn’t mean we can’t set expectations The damage has already been done in many cases, but it is within our power to reconstruct our built environment according to informed principles, just as it is possible to restore harmony in our natural environment by restoring the American Chestnut. Tomorrow, in another case study, we will compare two tourist-centric cities that experienced urban renewal very differently. Which Countries Have the Most Pavement Per Person? The answer might not be what you expect. The suburban development pattern is not inherently too costly to maintain: early suburbs sat much lighter on the land, with narrower streets and less public maintenance obligation. Let’s take a look at how the American suburb has evolved over time.